While reading through Margaret Roberts’ book which has 60 teas to revitalize and restore, I was most interested to learn that you can give tea to your dogs. This is not something I have ever though to do, even though I have used essential oils and rescue remedy in their water. I am a big fan of herbal infusions and swear by my parsley infusion I make for when I have kidney stones. According to Tea, the drinking of this beverage dates back to 350AD in China. Tea can refer to the drink made from tea leaves. or to the herbal infusions like I mentioned above. Camelia sinesis is black tea which is usually drunk with milk. Keemun, Lapsang-Souchong, Oolong and Yunnan teas should be consumed black. Our common Ceylon tea comes from Sri Lanka, and Darjeeling, Assam and Nilgri all come from India. Western teas include English Breakfast, Irish Breakfast, and my favourite, Earl Grey tea. To see what temperature to boil your water at for tea, please click this link. Masala chai is a black tea, blended with spices and herbal infusions and do not include tea and are therefore caffeine free. Margaret Roberts’ tells us that to make the perfect cup of herbal tea you need to harvest edible flowers and leaves from your garden. Please make sure that what you pick is indeed edible! Using a quarter of a cup of the flowers and/or leaves, pour a cup of boiling water over them and leave to steep for 3-5 minutes before straining. If using bark or seeds (always fresh and non irradiated of course) then use 1-2 teaspoons of seeds or 1 tablespoon of bark, to a cup of boiling water. Leave to draw for 5 minutes before straining. 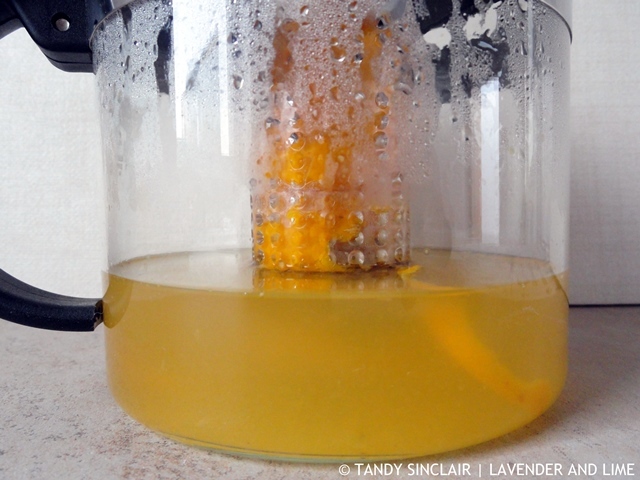 Add lemon and/or honey to taste, and sip slowly. The book is divided into flowers, herbs, and spices and these are listed alphabetically. Quite a few recipes caught my eye, such as catmint with lemon balm (p40), cinnamon soother (p50) and immune-boosting echinacea (p66). 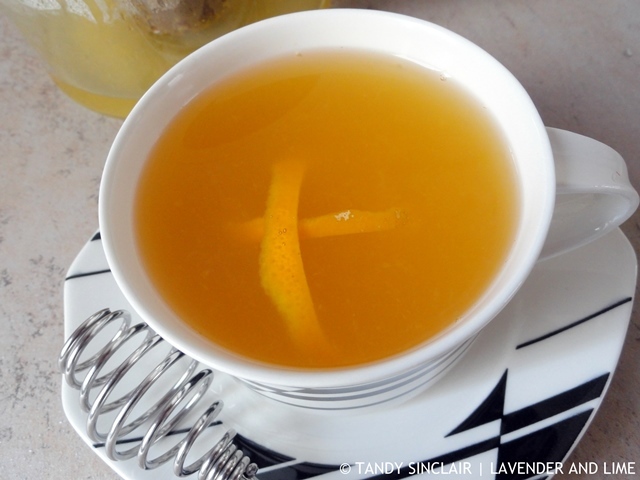 I have been making my own version of the ginger cold cure (p75) for years, with the addition of cinnamon. The book has recipes for teas to use as an anti-inflammatory (p78), anti-oxidants (p92) and for chest and kidney ailments (p104). The other blends that interest me are the marjoram tea (p112), raspberry iced tea (p140) and the stinging nettle tea (p168). There are many plants that I have never heard of and some like the violet tea (p178) that most people will know. The book ends with a list of ailments and a properties chart which is very useful. For the purpose of this review, I made the aniseed and orange winter warmer (p18) which was really good. Make sure to keep following my blog for the recipe. I’m going to have to check out this book. Tea time is so much fun, especially with finger sandwiches and pastries. Never heard of this book! Thanks for the review! I have a Margaret Roberts companion planting book so can bet this is a brilliant buy. oh I need this book, I drink a few cups of tea daily and I am such a big fan, also your tea cups are so chic! 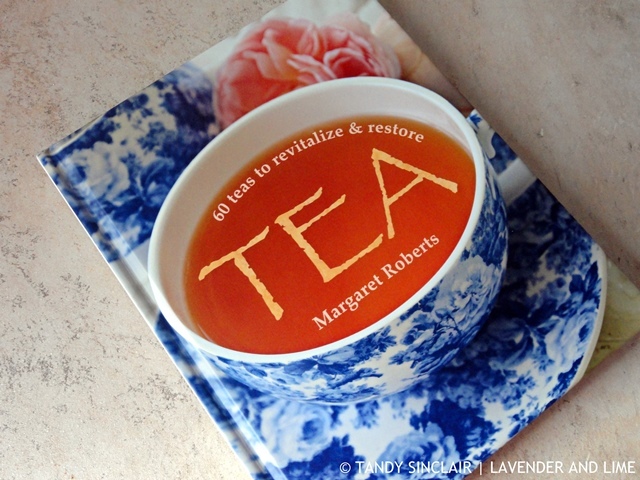 Looks like a great book for tea lovers! This sounds like a great book! I love all kinds of tea and am always interested in learning about natural health remedies. Surprised to hear that there are teas for dogs! What a fun post! I find tea very interesting and tea drinkers very sophisticated. I’m a coffee drinker myself, but married to a tea drinker. This book is now on my list as a gift option for him. Thanks for sharing! Great read Tandy! 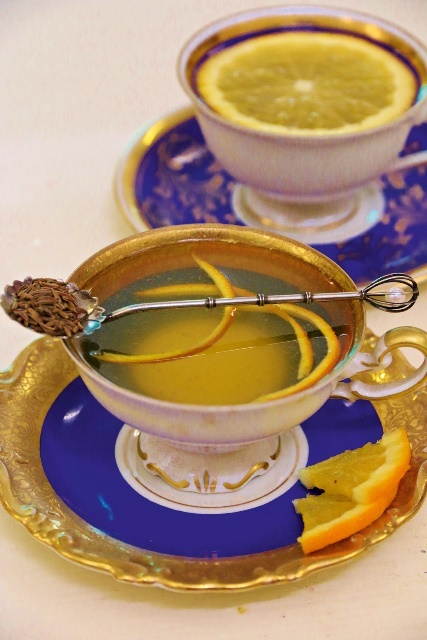 You and I are both on the tea time zone… both recipes and books.